As I prepare to embark upon this summer’s adventure, I cannot help but realize how closely I am following in my father’s footsteps. Just like me, when he was nineteen, he left France and went to study in Japan. This summer, I hope that I will be able to mimic my father’s experience in Japan, as a business development and marketing intern at the American Chamber of Commerce in Singapore (AmCham). As soon as I knew that I had been accepted as an intern at the American Chamber of Commerce in Singapore, I rushed to the nearest bookstore and did exactly what Professor Williams, the director of the Institute for Global Leadership, told me: I bought John Curtis Perry’s book: Singapore, Unlikely Power. I promptly devoured it within the span of two or three long readings, and as you might have guessed, was utterly transfixed. Singapore is nothing less than a miracle of economic, social and political planning that has yielded results far beyond the scope of what anyone could have imagined. Interestingly enough, in the International Economics course that I took at Tufts last semester, Professor Enrico Spolaore showed us data that illustrated the fact that with an open economic system, smaller countries usually fare better due to the control which they can exert upon the population. Case in point: Singapore. One would think that coming to Singapore would be a massive culture shock, but seeing as I have already been to China, Vietnam, India and Japan before, I think that my past experiences will be invaluable to understanding not only social interactions, but also business etiquette and decorum. Singapore is also known as one of the safest countries in Southeast Asia, which is reassuring. Furthermore, English is one of the official languages of Singapore, which makes it not only easy for me to intern in, but easy to do business in. Another factor that helped me make my decision to intern in Singapore is the fact that I know members of the Tufts student body who are Singaporean, many of whom I have met in the context of ALLIES, a student-led civil-military relations group within the IGL. When I arrived in Singapore on June 11th and made it to my lodging, I instantly set out to discover Singapore. What ended up happening was that I got lost in a mall, or in fact, six malls connected to each other underground. I quickly scoped out my workplace and made a mental note of all of the underground (and air-conditioned) corridors I would have to walk down to get to the office. Since then, I have been working as a business development and marketing intern at AmCham and am learning many new skills. I have been given the opportunity to work on diverse projects, such as creating an individual membership program at the chamber, doing market research on pricing schemes, mapping out a loyalty program, working on our marketing material, and creating new social media strategies for AmCham. The work has been very fulfilling, and it is a pleasure to see my input being implemented. Another major aspect of my internship is that I am able to attend many events as an intern. AmCham hosts over 200 events each year, focusing on different trends in the business world, motivational speakers, and networking nights. I have attended talks on GDPR, B2B marketing, and the ASEAN Smart Cities Network, and have enjoyed being able to meet professionals from a variety of sectors, such as consulting and finance, in which I would like to pursue a career. I have also had the opportunity to discover Singapore during my time here. 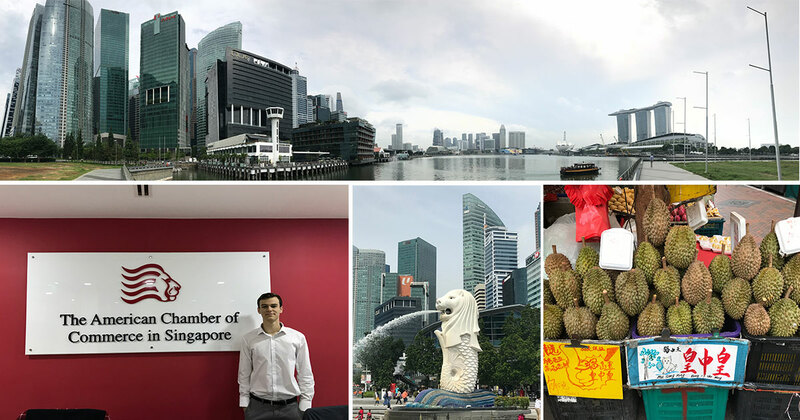 I have visited the Marina Bay area of Singapore, seen the iconic Merlion statue, walked through Chinatown, smelled Durians (commonly known as the King of Fruits), eaten at countless Hawker Markets (outdoor food markets) and seen the Singapore botanical gardens along with the stunning National Orchid Garden. I am looking forward to continuing my internship here in Singapore and cannot thank the Institute for Global Leadership enough for making this experience possible for me.